I’ve struggled to improve Samba (SMB) performance between my Mac Pro (Late 2013) running OS X Yosemite 10.10.2 and my CentOS 6.6 Linux server. The server has a large ZFS share with all my backups and archives as well as various KVM instances running off SSDs. My Mac Pro absolutely must access that ZFS share reliably and it would be nice if my two Mac Books were able to as well. I have a lot of experience with SMB and I’ve never had much trouble working with Linux servers and Windows clients. On OS X however I’ve never had any luck, the connectivity is slow, buggy and generally unreliable. Tonight I decided to install Netatalk, latest version on my CentOS server from source code. Below is the documentation of the procedure I followed and any outcome I was able to document. That’s not very impressive, just 17.3MB/s, let’s see what we get if we rsync over SSH instead of SMB. As you can see I more than double my performance by using SSH instead of Samba, 38.7MB/s vs 17.3MB/s, 10 seconds vs. 22 seconds. Imagine working with many large files over this SMB share and then consider that it’s also unresponsive between interactions adding more seconds of delay each time it’s accessed. Now you feel my pain. I did a little research and it seems Apple has something called AFP, which is apparently it’s native file sharing. AFP stands for Apple Filing Protocol and it’s non-proprietary linux version is called Netatalk. Sounds promising, lets go to their download page and snag the latest copy (3.1.7 as of 03/2015), direct link to Netatalk 3.1.7. Now we’re ready to download Netatalk and compile it. Now from my Mac Pro I was able to immediately see a share called “home” in Finder. When I clicked it in Finder I saw I could do “Connect As…”, I played with that first and it works just fine. In my case I connected with the username “storage” and the password I set for the storage user earlier. Another option is to use the “Go -> Connect to Server” menu option (Shortcut: Apple + K) which brings up a connection screen. There I typed in “afp://192.168.1.99” as the server and then clicked the + button to save the share to favorites. Upon attempting to connect you will be prompted to enter a username/password just as with the “Connect As…” button you will use the info you setup earlier, in my case “storage” and my password. Now you can use Apple + K or “Go -> Connect to Server” whenever you want to mount this share. This is my preferred method. 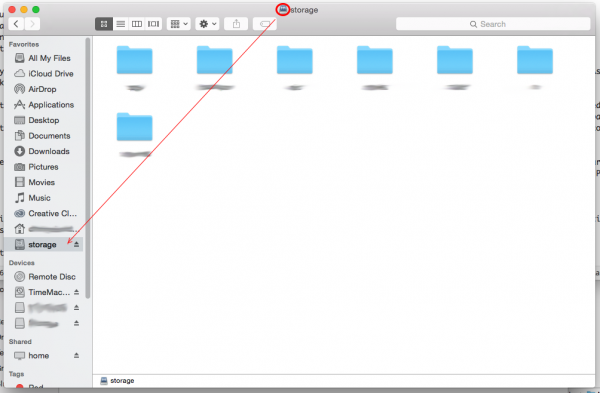 Once you’re in the new share you should look at the title bar of the Finder window and drag the little disk icon from the middle of the bar somewhere into your favorites bar in the left. That will give you a bookmark to your new share, so you don’t have to keep reconnecting to it whenever you close Finder. So as you can see its about 5MB/s and 5 seconds faster than SMB. I will continue tuning and see if I can squeeze out more performance. I will also update this article if I find any other useful information such as long term reliability/durability of the service. As you can see the two shares are called “tm_macbook” and “tm_macpro” with the same storage user added to both and “time machine” variable set to “yes”. 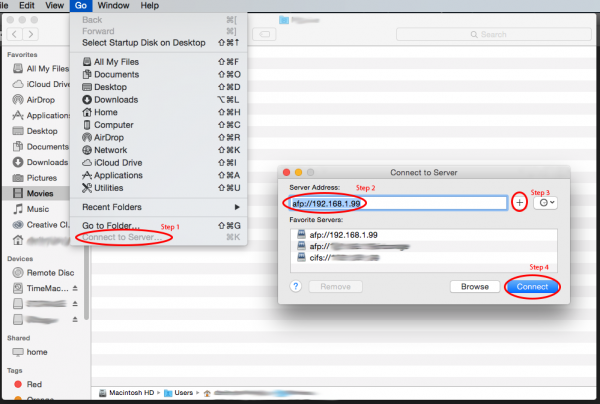 The reason for the shares using the same user account is so that “storage” and the relevant “tm_” share can be accessed at the same time by OS X. I initially created new user accounts for Time Machine, however I found that I couldn’t get OS X to connect to the share server under two logins at the same time. After its back online you will want to reconnect to AFP and then go to Time Machine and click “Select Disk…” If you’re connected to AFP you should see the new share you created, in my case “tm_macpro”. Select the share and watch her rip!